Back in mid May I flew out to the Alentejo region of Portugal to take part in a retreat organised by Natasha and Sarah. If you've read my last post, you will know that taking part in a retreat and meeting a bunch of strangers is quite a big thing for me and I was accordingly nervous since I hadn't actually met any of the people before. In suitable fashion then, on arrival at the airport on Sunday evening and after our very first encounter, all I wanted was a glass of wine to relax my nerves. It did the trick and I was able to break the ice - in a metaphorical way, you understand. The house was around an hour and a half from Lisbon in what felt like the middle of nowhere. Surrounded by trees and fields, all that was audible were birds, crickets and the sound of the wind blowing gently through the trees. No traffic, no noisy neighbours, no ambulances rushing past. Just the sound of nature. That's a big thing when you live in London... Seeing this place for the first time, I was immediately in love with it. 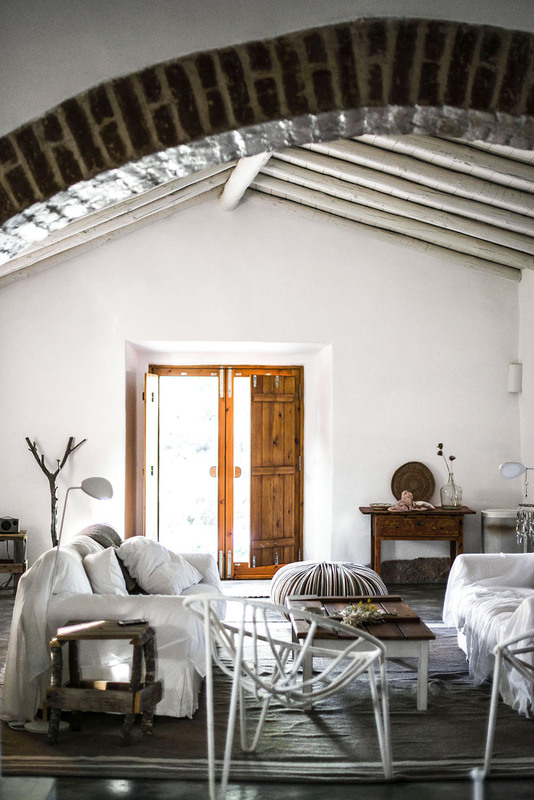 The simple but beautiful interiors with accessories that had clearly been carefully curated, the layout of the grounds (there were three small "bedroom houses" and one larger "kitchen & living house"), and the wild grounds themselves were not only quintessentially and very traditionally portuguese, but minimalist yet warm at the same time. Having spent most my childhood summers on the Algarve, this straight away brought back many memories along with a strong feeling of nostalgia. We were very lucky to have wonderful Anna there to look after us. She would make us breakfast every morning, a few traditionally portuguese evening meals and generally look after us and the house. Despite the language barrier (my portuguese is non existent bar a few polite words), we managed to have the occasional giggle and awkward but friendly chat greatly aided by 'google translate'. She was so wonderfully warm and it was clear that she possessed a fabulous sense of humour. On days when we weren't out, we would spend time relaxing, chatting and crafting. Sarah had painstakingly put together the most amazing kit for a delicate mobile with olive leaves which we were to put together whilst getting to know each other better. Only trouble was that I hadn't quite switched off from my stressed-out London mode and simply couldn't muster the attention span required to actually immerse myself in this session. Completely my own fault and definitely something I will have to address at some point. Marie (one of the participants) had brought along crochet kits for all of us (how lovely is that?!) and taught us how to do some basic crocheting. I'm quite proud that I actually managed to finish a tassel necklace, albeit not whilst on the retreat. Still, I'm actually wearing it (see here) and that in itself is a credit to Marie's teaching. Looking back at those few days, I'm truly glad that on this occasion I got over my apprehension when it comes to groups of strangers. Sitting together in the evenings and getting to know each other over food and wine was a wonderful experience and being able to do this in such beautiful surroundings made the experience even better. Sitting back in London at my desk, all I want to do is pack my bags and head back to Portugal.